A short break for some of the top men’s eights in the world after the World Rowing Championships in Amsterdam was followed by a trip to Northern Germany. 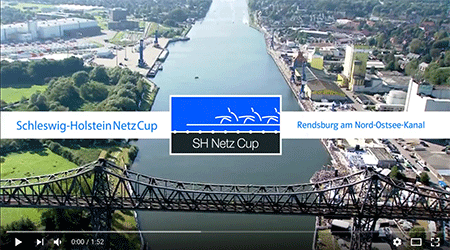 The E.ON Hanse Canal Cup in Rendsburg had many of the World Championship finallists in the men’s eight meet again to race over 12.7km. Held annually, this regatta invites some of the top men’s eights from around the world to race against the German men’s eight. This year Germany invited third. fourth and fifth place getters from the World Championships, Poland, the United States and France respectively. And also eighth-placed, the Netherlands. The long distance race between these five eights is the highlight of a weekend of sporting and cultural activities with the long distance race being held on the Sunday on the Kiel Canal. Early rain cleared for the start of the race with slight head wind conditions slowing down the boats. Germany finished first by about two boat lengths ahead of the Netherlands with the United States in third. The finish line was complete with a ‘Nydam Tveir’ – a 1700-year-old wooden rowing boat from Denmark which welcomed the eights at the end. Germany’s finishing time was 39:22 which was about four minutes slower than their 2013 winning time. The Netherlands were back 16 seconds with the United States 30 seconds behind Germany. Poland was fourth and France in fifth. This is Germany’s 11th win in the Canal Cup which has been raced 14 times. The last time that Germany lost was in 2010 to Great Britain. As well as the spectators that lined the banks of the canal, the race was transmitted live on the main public television station, ARD, to an audience of 1.2 million. There were 16 cameras filming the race including a helicopter and an onboard camera in the German boat. The live stream can be viewed until 21 September here. Included in the activities leading up to the long distance race was a 500m indoor rowing sprint between the teams. Poland finished first ahead of the United States, Germany and then France. The indoor rowing win gave Poland the right to pick which lane they wanted for the long distance race. The Netherlands did not make it to the sprint as they got stuck in several traffic jams on the way to Germany. On the day before the long distance race, for the first time, a public triathlon was held that introduced the competitors to the 12.7km canal rowing course. (A 500m swim in the canal, 25km cycle along the canal to the start of the long distance race and back, and a 5km run along the canal). On the same day a dragon boat race between the Northern Germany fire brigades. This began with a qualification in small boats with ten paddlers and was followed up with the final held in two boats of 50 paddlers each. The eights also raced in a sprint race held in downtown Hamburg. Germany won the final ahead of Poland. The second final had the United States finish ahead of France. In the men’s single sculls sprint race Cuba’s Angel Fournier Rodriguez beat Germany’s top sculler, Marcel Hacker. In the second final Junior World Champion, Tim Ole Naske of Germany beat Roel Braas of the Netherlands. Braas also raced in his country’s men’s eight. Next year’s E.ON Hanse Canal Cup will be from 11 to 13 September 2015.